Parents are requested to attend two classes before having their child Baptized. Parents must be registered members of Saint Anne Parish. The classes are held the first and third Wednesday of each month. Parents are required to register for classes by calling Sister Margaret Anne. Please do not choose your child’s Godparents until you receive the Church’s guidelines on Godparents. Baptisms are generally celebrated on the first and third Sundays of every month (but some months that may vary) at 12:30 PM in the Church. 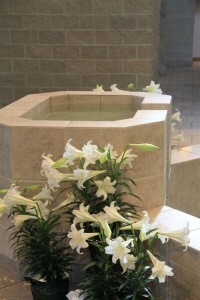 Baptisms take place within a prayer service, not a Mass. Ideally, parents will call the parish office early in the pregnancy so a time for attendance for class can take place. Coordinators are people who are trained to teach the classes and are present on the Baptism Sundays to help with the ceremony. Volunteers are always needed to help with the program.